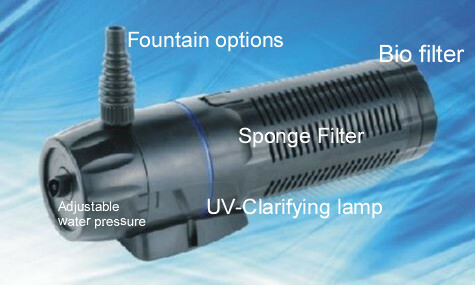 Our product (CUP-129) is an all-in-one pump that incorporates new technology with a combination of 1000lph pump, biological filter with filter sponge and uv-clarifier. There is also the added bonus of a fountain kit. This unit is suitable for ponds up to 2000 litres. The maximum flow is 1000 litre per hour with a maximum head height of 1.4 metres. This product has two filter sponges, one cylindrical course sponge and one fine impellor sponge. The course sponge is located around the UV clarifying light and the fine impellor sponge is located inside the impellor cover. Both sponges require regular cleaning to keep the pump, fountain and filtration running at optimal levels. Blockage of the sponges can cause a restriction of water with possible overheating and pump damage. The sponges trap and filter particulates and debris so the water released from the pump is cleaned. The CUP129 must be raised from the bottom of the sump/pond to reduce the intake of silt/sediment. Cleaning: Turn off the power. Remove the pump from the water and drain. Remove both sponges and wash under a tap. Keep cleaning until the water runs clear. DO NOT wring out sponges. Sponges will need to be replaced when worn out. If excessive blocking occurs clear the pond/water feature of the large debris with a net or pond vacuum. OPTIONAL: Remove the fine impellor sponge to increase flow. Note: Removal of this sponge can cause additional wear on the impellor and shaft with possible blockage of the fountain unit (if in use).